Hi Lovelies! Yesterday I was feeling less than chipper. I wanted to roll up in a ball for most of the day—hence the fact I’m in a ball for most of these photos. I thought this would be a fun way to display an outfit consisting of sheer tights and top. 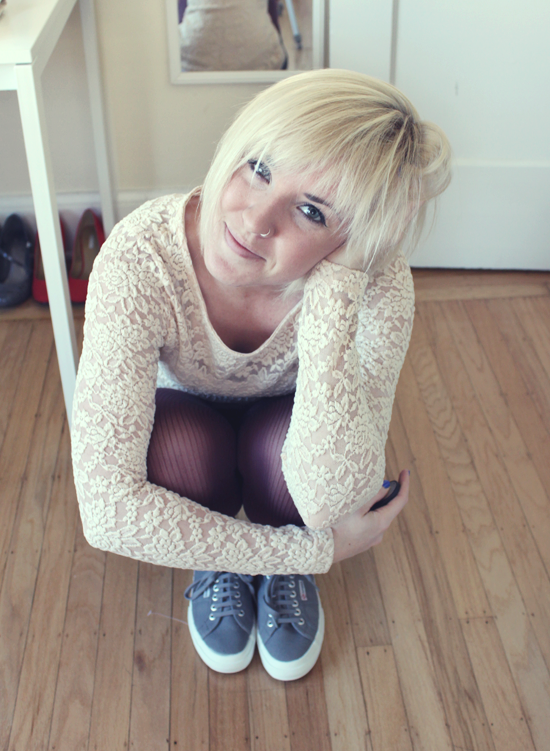 I just purchased a pair of grey Superga sneaks from Shopbop. I’ve only owned Converse and Vans up to this point in time. Feels like I am crossing over to the other side of sneaker land. So it’s not shorts season any longer butttt I finally chopped up a pair of old jeans to create these rolled up jean shorts. Yay for being better late than never! Well don’t let me distract you from cyber Monday! I just made a christmas purchase from Urban Outfitters, they’re offering $15 off with a purchase of $75. Sometimes it pays to leave a few items in your online shopping cart for later. What cyber Monday deals did you score on? love the title & explanation of this post!!! HA! great pics, you look super cute. I love the outfit and your pictures are so fun and cute!! i like your blue nail polish!! Well hi there! Thanks so much for stopping by my blog! I love your fun blue nails and your lace top. you look amazing! awesome hairdo and the sweater is even too lovely! That lace top is fantastic! Love your lacy shirt and those red tights! and thank you for checking out my blog! Everyone in my life is rocking the tights and shorts and I just love it! I already packed mine away but maybe I should pull a pair out! Hope you feel better today sweet girl! Love your hair style!!!! And outfit is also great! We have any cyber monday sales in europe.. its pity! Glad to be here via your sweet comment on my blog Haley…I’m so currently enjoying your latest posts. 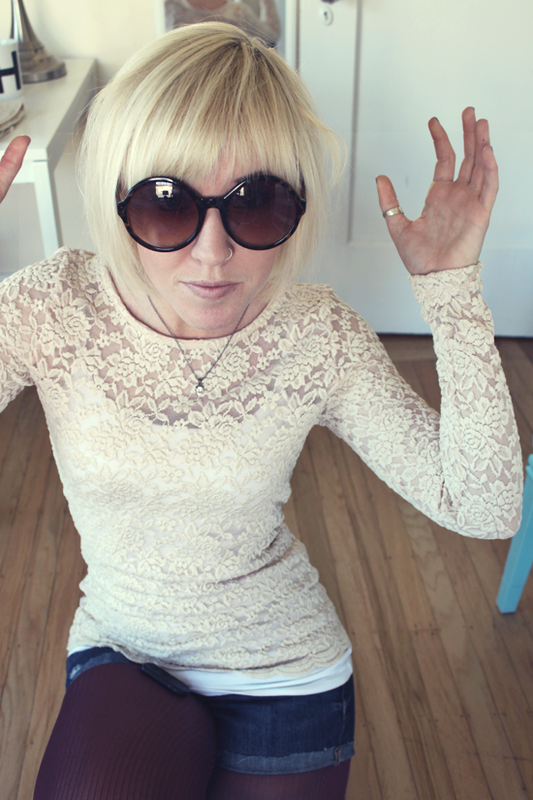 This lace top is my fave!!! You look gorgeous, I love your top and tights! Urban did have some great deals, huh! Thanks so much for stopping by my blog! It is so nice to find another fashion obsessed graphic designer! 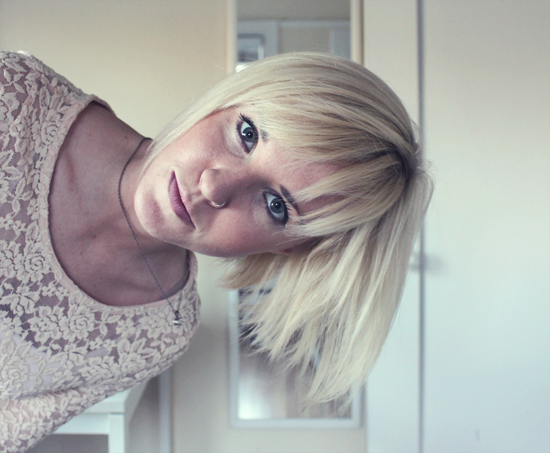 Love your lace top. That is adorable! I did my best to stay away from Cyber Monday, though it was extremely tempting… I did buy a pair of shoemint shoes for 30% off. Cute photos! Loving your sunnies! i lov that top of yours and your pictures are adorable! thanks for checking out my blog! i love yours too. i’m following via bloglovin (50)! That first picture… you are so gorgeous! I LOVE the burgundy tights! You look perfect, I adore your sneakers, so cool! Thanks for commenting on my blog 🙂 I love your hair! Wish I could pull it off. Also love that lace top!